Walk into most any machine shop and there’s a good chance you’ll hear it: the high pitch whine of a deep boring operation, the chatter loud enough to have even the hardest of hearing among us scrambling for a pair of ear plugs. It’s a problem that has plagued machinists since the day lathe inventor Henry Maudslay first chucked up a piece of steel and tried to bore a hole through it and has only gotten worse as metals have grown tougher and more challenging to machine. Not anymore. 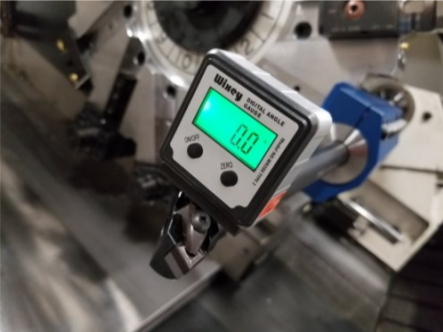 Kennametal’s latest weapon in the war on chatter is one that will have machinists everywhere saying, “I need that.” The new boring system boasts the most effective anti-chatter mechanism ever developed by Kennametal, and also offers an extensive range of indexable heads and shank sizes. There’s more to the story than making the shop a quieter place to work, however. Eliminating vibration and therefore chatter greatly extends tool life, never mind its positive effect on part surface finish. And when tools last longer, they can be pushed harder, with feed rates, cutting speeds, and depths of cut many industry experts once thought unachievable. 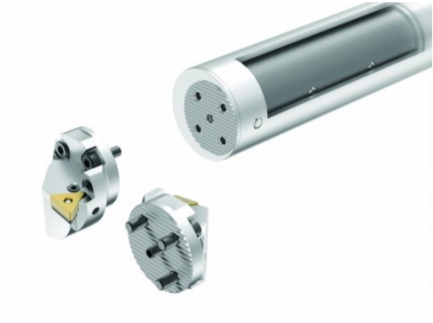 The vibration-free system offers superior performance in boring applications up to 10X diameter deep, Eichelberger explained, much deeper than solid carbide or heavy metal boring bars are capable of. Internal and customer test results show surface finishes as good or in most cases better than competitive “quiet bars,” with significantly more aggressive cutting parameters possible across the board. Considering the higher cost of a such a boring system, they’ll also appreciate the fact that the heads are replaceable in the event of a crash, avoiding damage to the bar itself. And users of Kennametal’s older boring system will find that their new heads fit perfectly with the use of an adaptor. Photo 1: Kennametal’s new vibration-free boring system boasts a number of technological improvements that allows a plug and play operation. An array of interchangeable heads that includes screw-on and lever-style clamping mechanisms in positive and negative rake configurations. Photo 2: Setting the head exactly on centerline is as easy as bringing the angle finder display to zero and locking the bar in place.